First published in 1996, this irreplaceable resource has now been updated, revised, and expanded by Kristine Stiles to represent thirty countries and more than one hundred new artists. Stiles has added forty images and a diverse roster of artists, including many who have emerged since the 1980s, such as Julie Mehretu, Carrie Mae Weems, Damien Hirst, Shirin Neshat, Cai Guo-Qian, Olafur Eliasson, Matthew Barney, and Takashi Murakami. The writings, which as before take the form of artists' statements, interviews, and essays, make vivid each artist's aesthetic approach and capture the flavor and intent of his or her work. The internationalism evident in this revised edition reflects the growing interest in the vitality of contemporary art throughout the world from the U.S. and Europe to the Middle East, Asia, Africa, Latin America, and Australia. Kristine Stiles is France Family Professor of Art, Art History, and Visual Studies at Duke University. She is the author of the forthcoming books Concerning Consequences of Trauma in Art and Society and Correspondence Course, An Epistolary History of Carolee Schneemann and Her Circle. Peter Selz is Professor Emeritus of Art History at the University of California, Berkeley. His many books include Art of Engagement: Visual Politics in California and Beyond (UC Press). The Bibliography may be downloaded at www.ucpress.edu/go/theories. 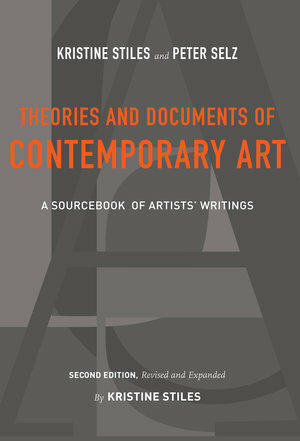 Download the bibliography to Theories and Documents of Contemporary Art, Second Edition (PDF).